Have you decided what you want to be when you grow up? I am leaning towards 33 years of life and still struggle with this question. I went to Junior College, check. Went to E.M.T. school, check. Started off as an English major at Stephen F. Austin State University, half-check. I owned a bakery, had a swimming pool store, then got into direct book sales. I managed a department store, I managed a feed store, now I help manage a rather large house. I guess I want to be a manager, but not really. There are people I see who have a plan, get a degree and pursue their dreams ardently. Then there are the rest of us, who, through a series of life choices have ended up someplace other than where we envisioned ourselves. Truth be told, I wanted to be a photographer for National Geographic. A rather lofty dream, to be sure, but someone has to do it. A good friend of mine, who is a few years older than me, called last week, struggling with this question herself. We both are smart, beautiful, funny, modest women who are flip-flopping around our lives hoping to land on something perfect. And we are not the only ones. I think sometimes, even those who are ‘living the dream’ so to speak, wonder in the wee, nighttime hours, if they have made the correct choice. If what they are doing is really their life’s work or did they, like so many of us, miss the boat somehow. Fortunately for me, and my friend, the boat is still sailing and the dock hasn’t sank. We just have to figure out what ticket to buy. I don’t know much but I do know this, I don’t want to be 60 years old and look back saying “I should have……..”. I guess that’s why there is not a walk to share with you all today. I’ve been walking a lot lately but not with camera in hand, I’ve been thinking, trying to focus on what lies ahead. It is easy to get so caught up in daily life – wake up, drink coffee, fix breakfast, go to work, do home school, walk, feed the animals, clean the house, fix supper, repeat – that years go by without much fan fare. The ideas, flitting through your head become more fleeting until they disappear entirely. This being said, you can’t just take a flying leap to follow dreams. At least, I don’t think that is wise. Once you figure out your dream, which as we know, can take years of struggle, you must consider the effect that dream will have on your family. In my family, we have to have two incomes, we home school and we have a farm. I can not throw my portfolio at National Geographic and fly off to Africa to photograph mating elephants. Not gonna happen. My daughter would cry, my husband would hate me and my chickens would probably die. But I can find a new dream. And I can buy a ticket. And I can still get on that damn boat. 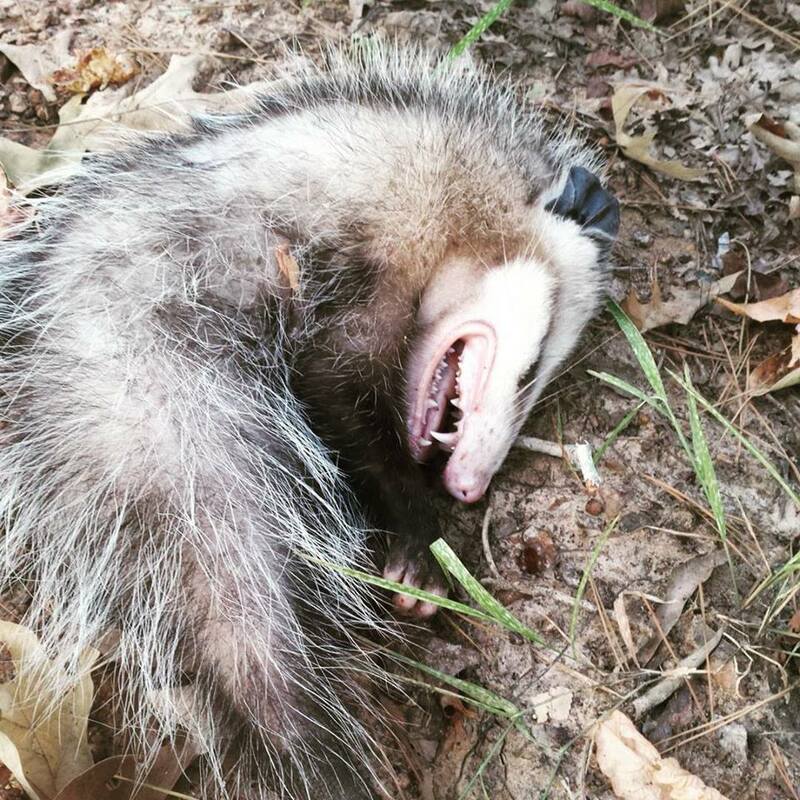 I took this picture on a walk last week, my dog caught and brought me this opossum. He knows what his life’s work is, to play dead when threatened. May we all perform our duties and live out our dreams this well. He sure looked dead to me! p.s. I went back and checked, he must have taken off like a rocket the moment we left, there wasn’t a trace to be found! Agreed! I just feel like I’m spinning my wheels some days. Okay, most days, lol! It didn’t happen for me until I was in my 30s .. I wasn’t living in the country though. I guess I have been very lucky .. And now I am living in the country And living my dream. It was a tough job but working at Disney World for 27 years was a wonderful experience for me! I was able to see, work on and experience so much of what the mind of an incredible man, Walt Disney, dreamed up and built! Just wish I could of met him but I started there shortly after he died! I did get to pick the brains of people he had hired in California when his dream was unfolding at Disney Land! I now enjoy the country life in rural S.E. Georgia where I was born and grew up! God is good and knowing Him and His promise for me through faith in His Son Jesus Christ gives me hope of a fantastic future, forever!